As a dentist, I enjoy the balance of science and art, along with the connection with people. I am dedicated to helping patients achieve and maintain long-term oral health and wellbeing, by delivering the highest quality, individual care. I strive to help each patient attain a healthy smile and improve their quality of life. I am an honest and compassionate dentist. It is important each patient understands I am here to help and support them in developing stronger dental health. I want patients to feel safe and relaxed in my hands: I am here to serve them and understand the responsibility that entails. Above all, I am committed to caring for each patient as a person: seeing and treating them with respect and empathy. My greatest reward is a genuine smile and words of thanks from a patient. 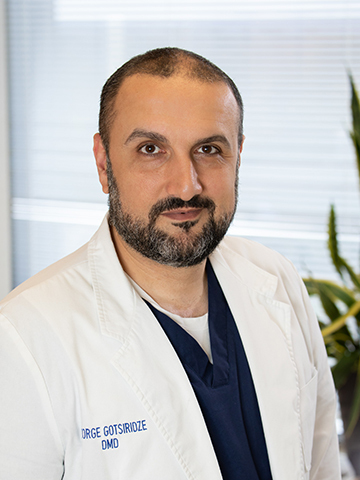 Dr. George Gotsiridze earned Bachelor of Science degree in Biology and Masters of Science from the University of Massachusetts, followed by a dental degree from Boston University Goldman School of Dental Medicine. After dental school, Dr. Gotsiridze attended General Practice Residency in New York and has been practicing dentistry since. Dr. Gotsiridze is passionate about continually learning. Dentistry is constantly changing and advancements in methodologies, along with new materials and technologies, improve patients’ care experience and results. Through continuing education, Dr. Gotsiridze ensures he exceeds patients’ expectations and delivers lifetimes of healthy smiles. Dr. Gotsiridze is a member of the Spear, Maimonides, and Seattle Study Clubs, as well as the Facialart Dental Forum. These allow him to collaboratively learn with his peers, from oral healthcare specialists, and from leading practitioners and researchers. Additionally, Dr. Gotsiridze is an active member of the American Dental Association and Academy of General Dentistry. He regularly attends meetings and lectures and studies all relevant dental journals and other publications. Originally from Boston, MA, Dr. Gotsiridze, his wife Lela, and their young daughter, Ana Alexandra, now call Bethesda home. When not caring for patients, Dr. Gotsiridze’s top priority is being with his wife and daughter, enjoying time together and creating family memories. He also loves traveling, reading, and spending time with family and friends.